Visit the ancient village of Lindos and its impressive 4,000-year-old acropolis on a 4-hour shore excursion from Rhodes! With an expert private guide at your side, travel along the islands east coast, and then explore Lindos Acropolis (entrance at your own expense) on a walking tour. Marvel at the sights of Byzantine ruins and an Ancient Greek temple set against the Bay of St Paul, and then visit the Church of the Ascension in Lindos village. The itinerary on this private shore excursion is flexible and can be tailored to your requirements. Start your shore excursion with a pickup from the Port of Rhodes, and then travel by air-conditioned minivan along the islands east coast with your private guide. 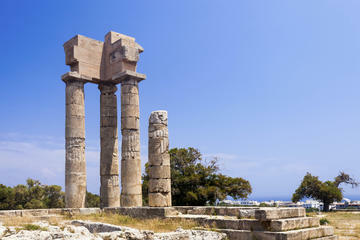 Pass through a collection of idyllic island villages, and then stop in Lindos, Rhodes famous ancient village. Lindos pretty streets are fringed by the sugar cube houses found on many a Greek island, but its the magnificent 4,000-year-old acropolis that gives the village its star appeal. Work your way up Lindos gently winding cobblestone streets, and head inside the acropolis to explore with your guide. Have your camera ready to capture sights of the ruined Byzantine fortress and an Ancient Greek temple, and gaze down at the sweeping Bay of St Paul. After discovering the delights of Lindos Acropolis (entrance own expense), make your way back into the village to visit the Byzantine Church of the Ascension. Admire its stately interiors and stained glass windows, and then enjoy some free time to explore the village independently. Return to your minivan, and travel back along the breathtaking coastal roads. Your private tour then finishes with a drop-off at the Port of Rhodes.